Sweat is an inevitable part of the summer daily grind; a gross inconvenience on the morning commute, and an unpleasant feeling when the working day’s done and the cool down is supposed to commence. When it comes to our wardrobes, we will often look to negate the effect of rising temperatures by swapping heavy autumn/winter attire for more breathable, lightweight pieces that are designed to keep us cool, even in the most stifling of conditions. However, it’s not just our fabric choice and clothing that needs to adjust as we approach the warmer months of the year – our shoe collection should too. After all, what’s worse (and more uncomfortable) than hot and sweaty feet? Keep your cool this season with our selection of versatile, comfortable and well-ventilated footwear – each option a guaranteed winner for any summer situation. For occasions when only a formal shoe will do, reach for a suede brogue or Derby. Far from the rigid polish of heavy leather styles, suede Derby shoes or brogues (best for optimal ventilation due to the uppers’ punching detail) are comparatively light in weight and offer a plush textural touch that’s much more in tune with the sunnier season. Given suede’s sensitivity, it’s essential to regularly treat the uppers with a good spray protector. We’d even advise you keep a suede brush in your bag at all times, as the material’s matte quality can cause it to pick up stains all too easily. Also key is smart colour selection; make sure to choose a pair in a shade that isn’t too dark, as you will often find that black, navy and charcoal options fade fast. Instead, pick out paler hues such as stone, camel, tan, khaki, or pastel shades, which work particularly well for a summer wedding. Both of these silhouettes look their best combined with sharp summer-weight suiting or smart-casual separates – think white/beige slim-cut chinos and trousers, linen shirts, cotton blazers, pique polos and tailored shorts. Where to find them: Grenson, Church’s, ASOS, Ask The Missus, Hudson, Dune, Kurt Geiger, Reiss, O’Keeffe, Mark McNairy, Mr Hare, J.Crew, Common Projects. These rubber-soled beauties are typically made in canvas, suede or leather, and while the latter isn’t necessarily a no-go for summer, the other two fabrics will likely keep you significantly cooler – so consider saving leather designs for more inclement conditions. What’s more, canvas and suede can be dyed more easily than leather, so you’ll have a much wider palette of styles to choose from. A nautical colour scheme of red, white and navy is a time-honoured classic, while variations on the theme also work well – think tonal shades blue. Boat shoes offer the perfect opportunity to inject a bit of light-hearted sartorial fun too, so don’t be afraid to play with pattern – a judiciously placed stripe or polka dot can be particularly striking when teamed with an all-white or neutral-heavy outfit. Finally, avoid designs with excess toggles and laces; just because they’re supposed to be worn on the deck of a boat, it doesn’t mean that they have to look like flotation devices. The ideal pair should fit and feel a bit like a slipper, so all that excess baggage is wasteful. Where to find them: Sperry, Sebago, Timberland, Lacoste, Selected Homme, Timberland, Tommy Hilfiger, Bellfield. While the skater-style slip-on trainer is trending for spring/summer 2015 (particularly minimal leather versions), a woven upper lends more of an eye-catching, dynamic finish to your footwear. Some might argue that designs in tan and brown run the risk of looking a little like a naff wicker basket, but we say it’s a risk worth taking. The right woven style, whether in the form of a loafer or luxe espadrille, will lend your summertime tailoring looks a classic sixties feel – think Jude Law in The Talented Mr. Ripley. For a sportier, streetwear-inspired look, swap latticework for mesh uppers in colours like white, off-white, navy, and even brighter hues if you’re feeling especially bold. Where to find them: Rivieras, Dune, River Island, Topman, H By Hudson, Office, ASOS. The best leather sandals have a touch of ‘gladiator’ about them; they’re not silly, strappy things, but sturdy and strong instead. Avoid, if you can, leather thong sandals, as they will chafe until broken in properly (and – if we’re being frank – by then, the good weather will be over). Instead, opt for clean, utilitarian styles with wide-cut foot straps that will ensure comfort and help retain a sense of masculinity. On that note, it’s important that the strap design isn’t too busy, or you’ll run the risk of feminising your feet dramatically – fine if that’s what you’re after, but probably not best-suited to most of your hairy, big-toed ‘plates of meat’. 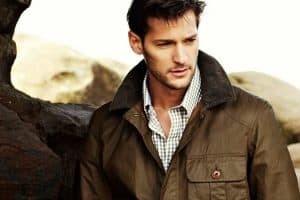 When it comes to colour choice, black leather options are understated and effortlessly cool, while brown and khaki green designs can be worn with everything in your existing wardrobe and tend to develop their own unique patina over time. Remember that sandals should be simple, not complicated – a single colour style with two to three straps and a leather or rubber sole is ideal and will guarantee you get continued wear out of them for many years to come. As for the ‘to sock or not to sock’ conundrum – avoid them at all costs, unless the feet in question are genuinely offensive (in which case you probably shouldn’t be baring them at all). Where to find them: Jerusalem, Boss, Paul Smith, Aldo, AllSaints, Mango Man, Dan Ward, Gucci, Topman, ASOS, Ted Baker. On first glance, the driving shoe may seem like the poor cousin of the boat shoe, but they’re actually the richer cousin of the moccasin. Extremely lightweight and comfortable, a pair of driving shoes is the closest you will get to wearing slippers outside of the house, without actually wearing slippers. It’s a versatile silhouette too, and considerably more so than several other options on this list. Carrying the markers of more formal styles, the driving shoe sits in that smart-casual sweet spot – able to be dressed up with warm-weather tailoring as easily as it can down with chino shorts and a tee. For maximum versatility, buy them in classic black, brown, tan or lighter neutrals that are perfect for the sunniest days of the season. Alternatively, if you want to make more of a statement, try a pair in a bolder colour like cherry red, jade green or royal blue – just bear in mind that brighter hues and rubberised soles don’t always sit well together and can appear cheap if you don’t opt for quality materials. Like loafers, driving shoes are ideal for wearing sockless, so look to team them with a simple pair of chinos rolled just above the ankle. Where to find them: Tods, Gucci, Reiss, Mango Man, Zara, Car Shoe, Topman, Bobbies. So there you have it; the five different types of summer shoes that every man should be looking to add to his fair-weather collection this year. Keep it cool, keep it clean and keep it fresh – with our guide, sweating it (literally and figuratively) should be a thing of the past. Which footwear styles do you swear by for summer? Will you be adding any of the above designs to your wardrobe this season? What brands would you recommend for each of the silhouettes showcased?